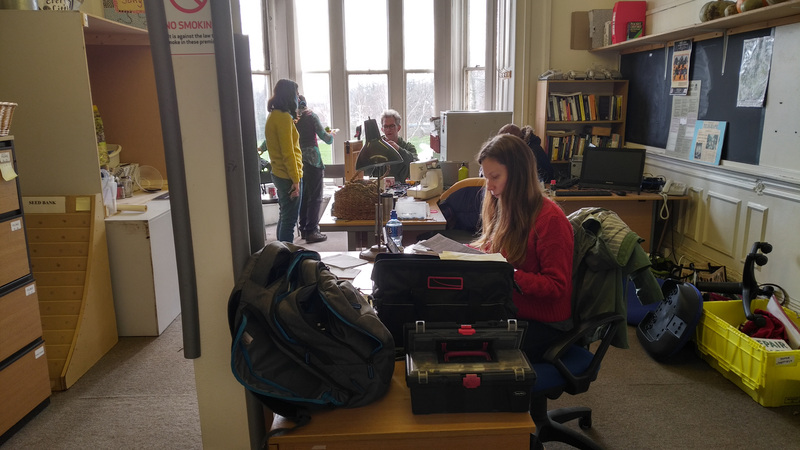 A big Thankyou to everyone who came along to our extra Repair Cafe at Abbeyfield Park House to celebrate the re-launch of the Toolbank there, which is operated by our friends at Green City Action. 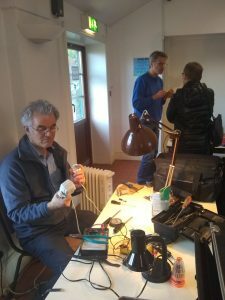 An excellent day was had by all and it was a great oportunity to bring the Repair Cafe concept to a totally different area of Sheffield. After a slow start we eventually got into the swing of things as a steady stream of items were brought in for our fixers to look at. We even found a couple of broken chairs around the building which Alan and Gordon managed to repair quite easily. Also a big thankyou to Emma, who has only recently joined us. 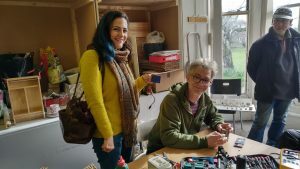 This was her first full Repair Cafe. 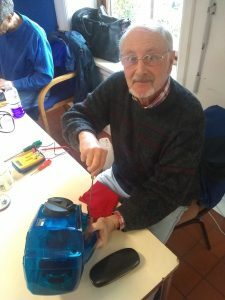 Despite claiming to have no repairing skills she still managed to diagnose and fix a table lamp with a little help, which is exactly the type of knowledge sharing Repair Cafes are all about. Gareth took a break from his usual computer repairs to fix ‘big ben’. The Bluetooth speaker, not the bell from London. Our next event will be at Strip The Willow on April 14th. 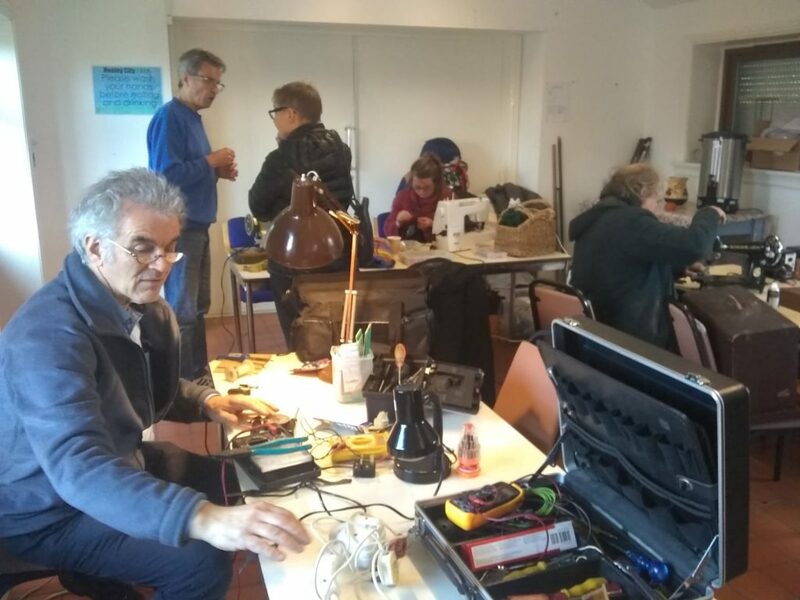 We had another great Repair Cafe at Heeley City Farm yesterday. 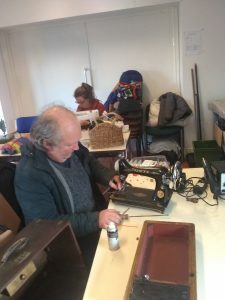 Lots of different items were brought along by their owners to be fixed, including a beautiful antique Singer sewing machine, an old wall clock, modern clockwork Radio, a mirror, an electric massager and lots more. 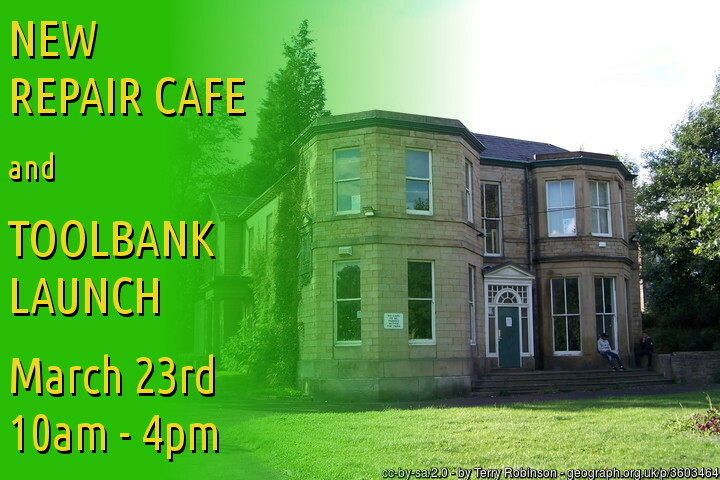 Our next Repair Cafe is a special one-off event at Abbeyfield Park House to celebrate the re-launch of Green City Action’s Community Toolbank which is based there. Our Radio expert Peter, working on an unusual clockwork and solar powered example. Gordon gets to grips with an electric massager. 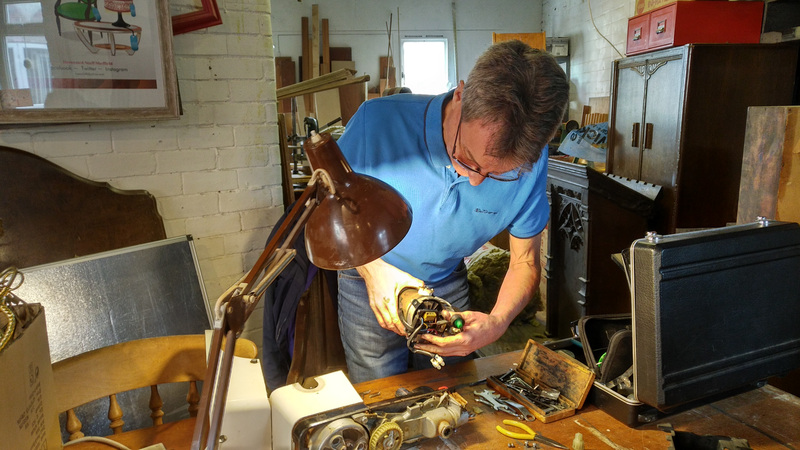 One of the more unusual items to come into a Repair Cafe recently was this vintage oil lamp, which had been picked up by myself from an auction as part of a job lot of oil lamp spares. The problem with this one was that it had been converted to electricity and in the process someone had cut a hole in the brass font for the cable to pass through. I hate the practice of converting vintage items into electric lamps. It devalues the item and often looks incredibly silly. I also have a 100 year old candle stick telephone that had the lamp treatment which I’m in the process of converting back into a phone. 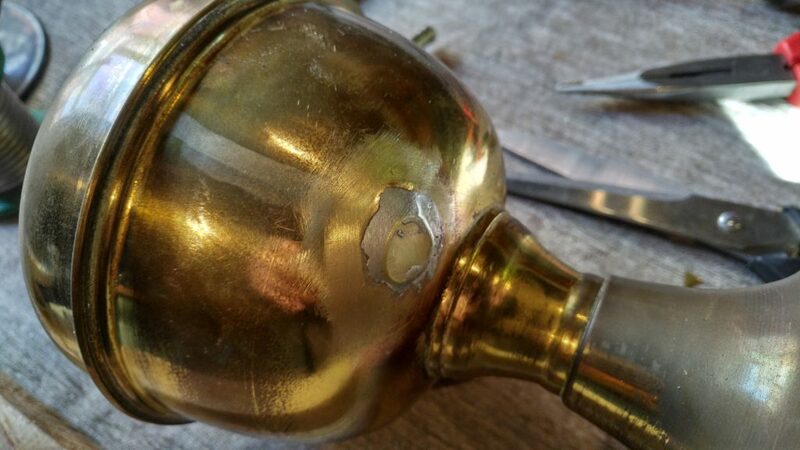 Obviously this hole would need to be patched up before the lamp could hold oil again, so using a bit of scrap brass, Gordon set about a solder repair. It’s not the prettiest fix ever. But I was more concerned about practicality and it not leaking than aesthetics. I’m pleased to say the Repair was a complete success and the lamp is now awaiting the sourcing of a genuine vintage burner, glass chimney and shade. We just finished the Repair Cafe at Strip the Willow. Thanks to everyone who came along today. 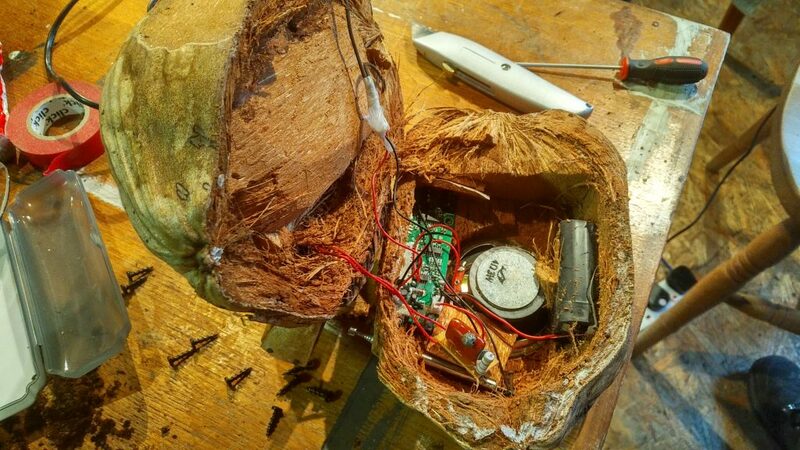 One very unusual item that came in was the coconut radio pictured above. It stopped working and the owner was hoping we could fix it as a nice surprise for her partner. Unfortunately all the parts were glued into place, so we couldn’t get all the components out to test them. This made a Repair impossible, but we just thought you might like to see it anyway. Anyone who was around in the 1980s will most likely remember the video format war between VHS and Betamax. But did you know there were other formats around too? One of these lost formats was U-matic, which has a special place in history for being (possibly) the first cassette-based video system, introduced by Sony way back in 1969 and arriving in the UK around 1971. U-matic was originally a consumer format. However the high price of the machines was prohibitively expensive for most people, so it would be at least another decade before VCRs were a common site in many homes. One of the benefits of U-matic over later formats was a surprisingly good picture quality. This led to the format being adopted by television stations, especially in news departments, giving rise to the system we now commonly know as electronic news gathering. 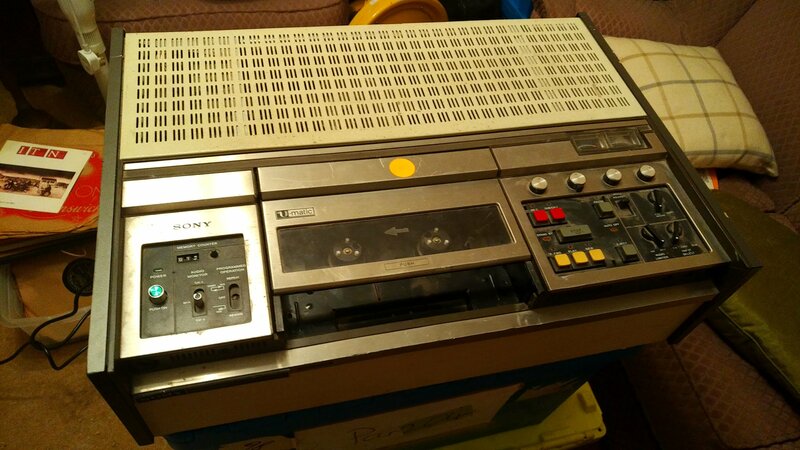 The machine in the picture above is a Sony pro-sumer grade unit dating from the mid-70s. I got it because I have some U-matic master tapes that originated from Elstree Studios and I wanted to know what was on them. So I spent weeks scouring E-Bay before a suitable machine appeared. When it arrived the VCR was in a fairly poor condition. One of it’s plastic feet was missing and when powered up not much seemed to happen. A motor started up inside and an internal light came on but that was about it. So an evening was spent freeing off all the moving parts that had jammed up through years of inactivity. This in itself is not easy. The presence of precision recording heads and delicate sensors means that squinting everything with penetrating oil is a definite no no. So every moving part was made to move again by carefully working it backwards and forwards. Over the period of a few hours the machine gradually came back to life. First the eject mechanism was sorted. Next came the tape loading system that wraps the tape around the head drum. After a whole evening’s work the mechanics are now working as they should. That is as far as I’ve got for now. The next stage will be to couple it up to a TV to see if there is any kind of picture. One type of repair we sometimes get asked about is how to restore wooden furniture. Parts might be loose or broken, but most often the problem is some sind of mark in the finish, such as a scratch or a ring left by a cup or glass. 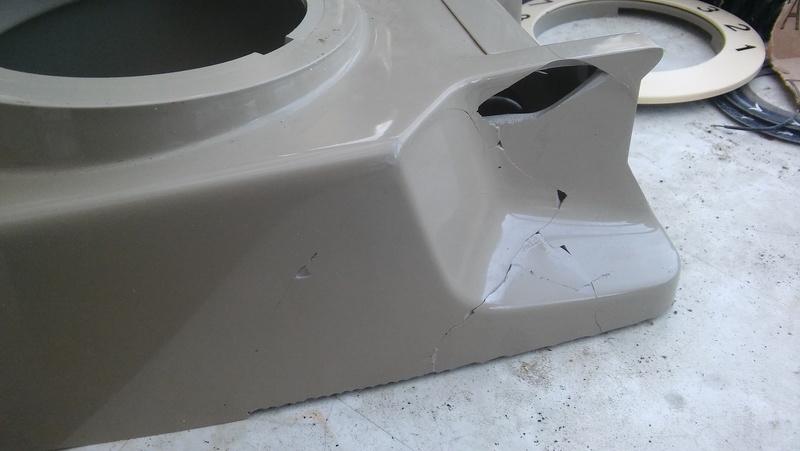 There are various ways of dealing with these marks and a successful repair often hinges on choosing the right method for that particular case. 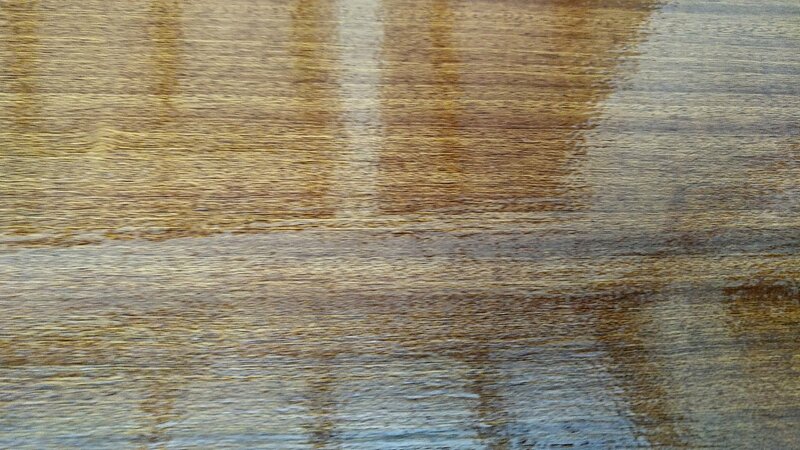 The finish on furniture can be many different things, all of which respond differently to treatment. Also the wood itself might be hardwood, softwood or engineered alternatives such as chipboard or ply. Chipboard usually has some kind of surface applied to it to make it look like a natural wooden board. If you’re lucky the surface will be a thin veneer of natural wood, but modern furniture can have a paper or plastic overlay with a wooden design printed onto it. The photo above shows a shelf from a 1960’s sideboard. Although it looked like real wood at first glance, it’s actually chipboard with a wood veneer. The problem was a lot of white ring marks, left by wet cups or glasses. These marks were most likely caused by water, but some ring marks, especially on tables, can be caused by alcohol eating away the polished surface. As I wasn’t sure what caused these marks, I decided to sand down the surface and start again. This is quite easy with solid wood, but with chipboard you have to be very careful not to destroy the thin surface veneer. Once the shelf was sanded, it was time to apply a new finish. You could wax it or even French Polish it. However as it’s not a particularly valuable piece and it needed to be functional and water proof, I simply painted it with a high gloss yacht varnish. Most of this will soak in during the first coat, but a very light sanding once dry and then a second coat will give a beautiful shiny finish which is almost impossible to achieve any other way. 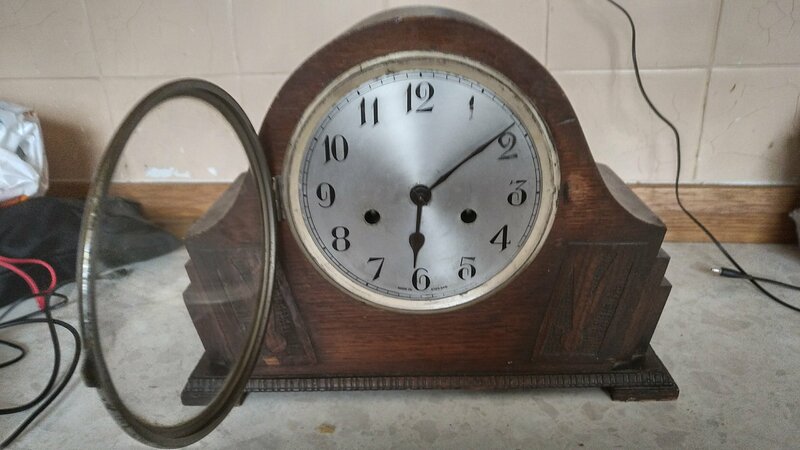 Inspired by the clock repairs on TV’s ‘The Repair Shop’ just recently, today I decided to finally take a look at a clock taht’s been sitting on the side in my kitchen for quite a while now. I bought it a few months ago and although I got it to tick, it had a curious problem with the striking, which resulted in it only striking once at the top of every hour. I knew I had to get the mechanism out of the case, so first I removed the pendulum. Next the hands came off and finally 6 screws from the inside which held the brass mechanism to the wooden case. I could then remove the whole mechanism in one piece from the back. It didn’t take long to spot the problem. The entire mechanism was filthy, with lots of old oil that had gone hard and sticky gumming things up. On part thatw as well and truely stuck was a lever that drops down onto a snail cam to count the correct number of chimes for each hour. This was stuck in the raised position with the result that there was only a single chime each hour, no matter what the time actually was. With a bit of careful cleaning and new lubrication with light clock oil, the mechanism finally loosened up. After putting everything back together the clock happily chimed seven times at 7pm, fittingly right in the middle of tonight’s episode of The Repair Shop! Once a piece of plastic is smashed that’s it, right? The damage to this phone occured in the post as a result of very poor packaging by the sender. Old telephones should never be sent with the handset resting ‘on the hook’ and it is the handset bashing against the maid body casing that likely caused this breakage. Luckily the broken parts were still in the box, so it was possible to retrieve most of the bits that had been smashed. 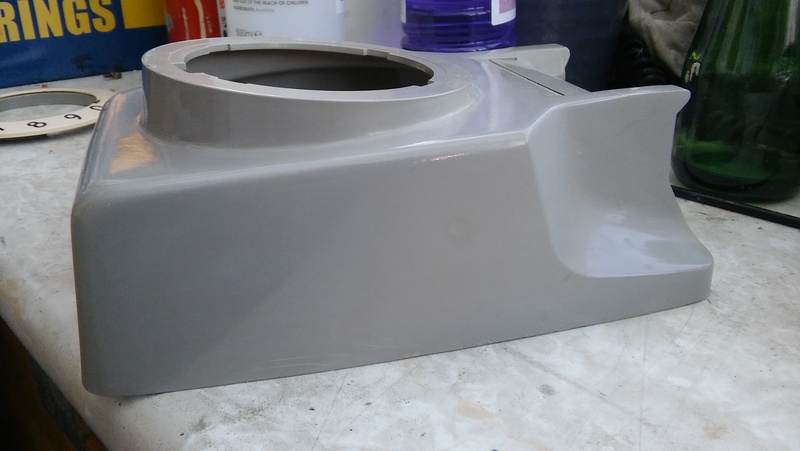 As this is a later GPO casing made of ABS plastic, I used my own system of ‘chemical welding’ to stick the parts back together rather than gluing. This has the advantage of not adding a foreign material (ie glue) to the joint, so it is often possible to make the repair as strong as the surrounding material and also completely invisible. 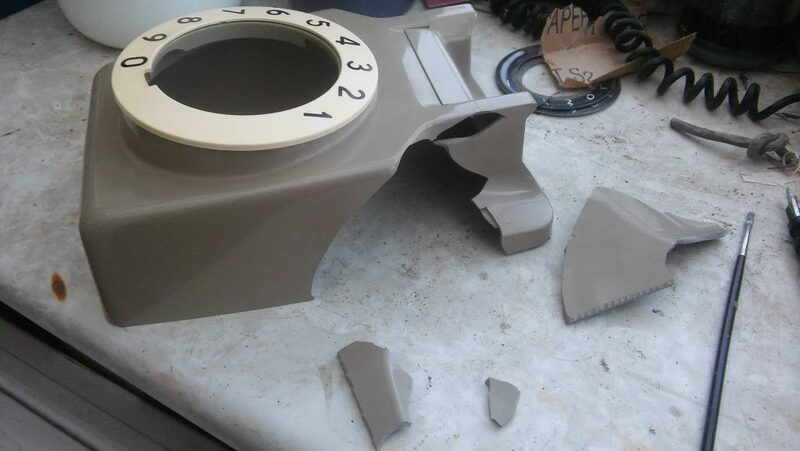 The first stage in the process involves identyfying all the broken pieces and making sure the edges of the parts are clean. It’s best to try the pieces together for fit before welding begins. The welding process itself involves slightly melting the edges of the broken pieces using a chemical process to make them just sticky enough to bond together without the use of glue of any kind. The chemicals then evaporate and the plastic returns to a solid state, making the joint as solid as a single plastic piece. At this stage the joint lines can still be seen, along with any areas where the pieces of broken plastic could not be found. Luckily, in this case I only had one large missing piece and a few very small chips, as you can see from the photo below. The next stage is to use a plastic solution the same colour as the case. I always keep pieces of broken ABS and just happened to have some parts of a broken dial surround which were an exact match. The idea is to desolve into the solution to make a sticky, almost paste-like consistency. This is brushed into the cracks with a stiff artists brush. the paste will fill the cracks and any small missing chips. The aim is to over fill the cracks slightly so they can be sanded back to a flush surface. Once the sanding is done, more plastic solution can be brushed into any areas that are still found to be low. Sand again and the cracks should have disappeared, although the surface will be dull and scratched. 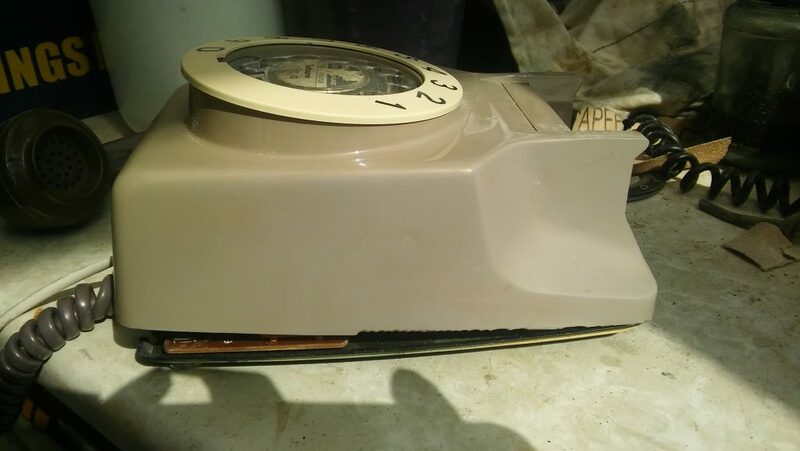 At this stage I happened to start investigating the telephone’s back plate and internal mechanism and just happened to find the missing piece of plastic sticking out from under one of the bell gongs. So I did have all the bits after all! This final piece was welded into place and the joints filled using the same process as before. The whole surface is now wiped over with plastic melting chemicals on a clean lint-free cloth. Again this liquifies the surface slightly and helps to remove and remaining imperfections, although the surface will still be slightly rough. This can be cured by wiping with a different and slightly weaker chemical mix which is effectively equivalent to using a very fine grade of sandpaper. This will proabbly leave a white residue, but this can be removed by using an abrasive polish next such as ‘T-Cut’ or ‘Brasso’. Once polished the finish should be nice and shiny as below, with little or no evidence of the joints between the once broken pieces. The photo above shows the repair almost finished. As you can see, there is very little evidence of any restoration taking place. There is however a slight colour mis-match between the area that has been restored and the rest of the casing. This is because ABS plastic yellows slightly over time, so the grey case takes on a slightly brownish hue. Where the repair was sanded also had the side effect of restoring the original colour, so the rest of the case would need polishing using our in-house developed colour restoration process. 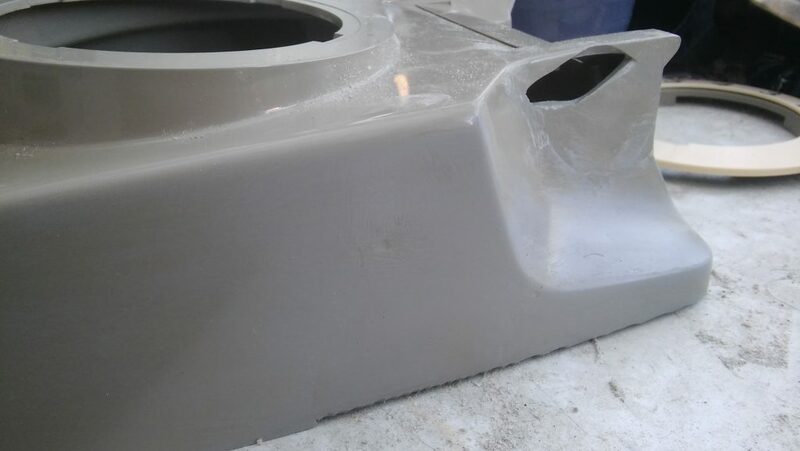 There is also a nibbled edge to the case still evident which was later rebuilt with a stiffer version of the plastic solution and sanded to shape. The fional picture above shows the finished repair, with the nibbled edge rebuilt and he whole case polished to make it all colour match.